The isotope analytics is based on a comparison of isotope values of different samples. Representative and authentic samples are the foundation for that. Hence choice, sampling, the sampling process itself and sample shipment should be conducted with great care. The client is in charge for the sample acquisition and the shipment of the samples to the laboratory. In case there may arise questions or problems, it is recommended to clarify those with our sales contact prior to further actions. If needed, it can be checked if Agroisolab GmbH may have got suitable reference samples for your case already. In individual cases, and if wished by our customers, Agroisolab GmbH is able to subcontract the sampling to suitable companies. Given below, we have compiled important practical information about experiences that we gathered during the past couple of years. They are supposed to contribute to avoiding unnecessary delays of carrying out your jobs. In case the samples to be tested are goods in containers (e.g. beverages in bottles, rice in bags) ideally an unopened original container should be sent in. In case the samples are taken from loose goods (e.g. grain from a particular batch), it is recommended to collect small quantities at different locations and blend them into a single sample. In case of countable goods (e.g. eggs, apples) it is normally required to provide several pieces. distributed around the entire field. For the reference sample acquisition it is absolutely mandatory to obtain authentic samples of a location. There is a risk not to be able to obtain authentic samples if they cannot be collected at their location of origin. However, the risk can be minimized by a careful selection of the sample source or by collecting a greater number of reference samples coming from different sources, respectively. If the analysis is to be conducted because of a suspected wrongful declaration and filing a law suit is considered, it can be advisable to plan already the sampling step according to officially accepted guidelines. If in doubt, we would kindly like to ask you to contact our sales team for clarification. at the time when they will have been received in the laboratory. Unsuitable and unidentifiable samples cannot be tested unfortunately. An appropriate sample packaging should thus be chosen thoughtfully. During the summer, careful and rapid shipment must be ensured in case of perishable goods. Vacuum sealed or deep frozen shipments can be a very suitable alternative for sending samples of some products (e.g. meat). Small, tightly closable cans with twist-off lids are suitable for eggs since every egg must be packed up individually. Fruit and vegetables can often be sent fresh depending on kind and season. Styro-foam boxes, that can be equipped with cooling packs if needed, have proven very useful as containers. Squishing of the sampled goods can be prevented by suitable filler materials. Berries can be put into a robust and closable plastic box additionally, for example. Loose goods, e.g. sugar and sufficiently dry grains, can be shipped in a well sealed freezer- or plastic bag. Bottles can be sent in their respective trading packages without problems. If in doubt, the most suitable way to package your samples can always be clarified with our sales team before sending something out. Unfortunately, it repeatedly occurs that samples are delivered in flawless quality but it is impossible to identify them: Handwritten labels using a water proof marker on freezer bags arrive at a washed off, unreadable state, notes or tags were separated from the wrapping material and are then found somewhere in the package. Help can be found by using e.g. a second freezer bag into which the packaged and labeled product is put once again. In case a tag comes off, it can at least still be allocated to its product. A reliable courier service should be employed for shipping the samples which is particularly important if the samples are perishable goods. An express delivery the next day should be guaranteed. Express deliveries on a Saturday are to be avoided because the samples can not be processed before the next Monday. detailed description of the samples including all needed information concerning origin and identification, special marks like ice stamping, charge-No, etc. Here you can download the form sheet . For any received shipment the customer received a confirmation of receipt directly after reception of the samples per fax. In case this confirmation receipt is not received by you within the usual time frame, you should inquire if the sample actually was received by us or if there had been delays or even a loss during transportation. Usually the processing time is 5 work days after sample arrival. If the laboratory is very busy, this time frame can be prolonged to 10 working days. If results have to meet a certain deadline, this must be agreed in prior with our sales team. For urgent work orders agreed in prior with our sales team for which the results are needed in less than 5 work days, corresponding surcharges apply. The customer is informed about the results in terms of a results report that will usually be faxed or emailed in prior. The customer eventually receives the final report in the mail in addition. When the work order is issued to us, the customer decides whether the results report is to be written in English or in German. 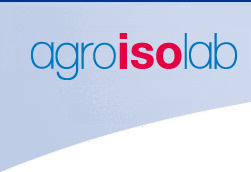 The general terms and conditions of Agroisolab GmbH can be downloaded here as a PDF File (only available in German language).